Thousands of people pelted each other with tons of ripe tomatoes Wednesday, creating a red, mushy mess in the annual "Tomatina" street battle in eastern Spain. At the fiesta in Bunol, 160 tons of tomatoes were offloaded from six trucks into the crowd packing the town's streets for the hour-long battle that attracts many foreigners among the around 20,000 participants. People cheered and jumped in the party atmosphere, with some people wearing fancy dress but most in T-shirts. As the trucks pulled into the narrow streets, the revelers chanted, "Tomato! Tomato!" To avoid injuries, revelers are instructed to squelch the tomatoes before throwing them. Even so, many donned swimming goggles to protect their eyes. People on balconies overlooking the festivities also were pelted, and tomatoes left red blotches on buildings' white walls. Canadian photographer David Trattlas said it was his 15th year at the festival. "The last week of every August is the best week of the year, the most social week of the year. I can't think of being anywhere else except here, in this village, with this group of people," he said. 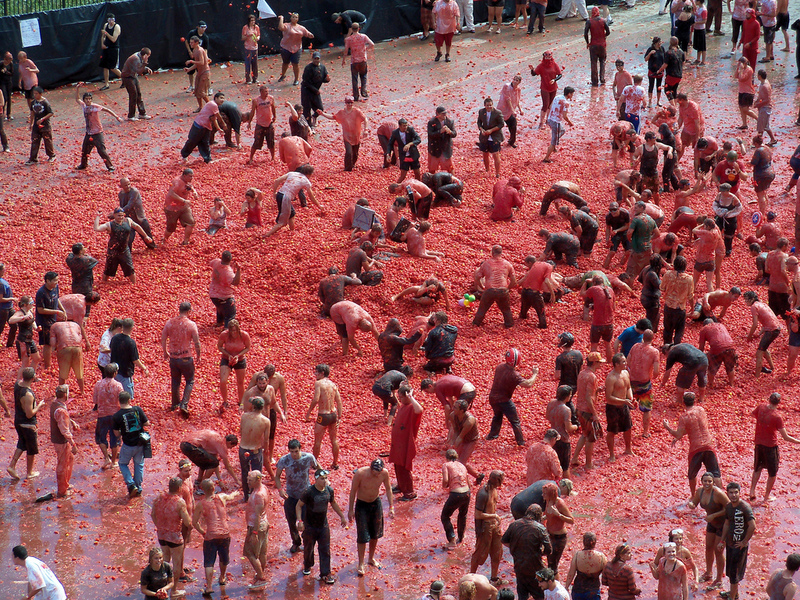 After the fight, the participants and the town's streets were drenched in a sea of red pulp. Organizers hose the streets down within minutes of the event ending at noon, while participants could use public showers. The paid-entry event was inspired by a 1945 food fight between local children in the tomato-producing region. I have an odd glut of tomatoes in my garden this year. This sounds so much more sensible than "the running of the bulls".